ArtsPower Theatre will kick off Sherwood Center for the Arts' Family Matinee series on Oct. 14, at 2 p.m. The Sherwood Center for the Arts kicks off its Family Matinee Series with "Chicken Dance," performed by ArtsPower Theatre on Saturday, Oct. 14 at 2 p.m.
For over 30 years, ArtsPower has reached more than 13 million children and families throughout 49 states. 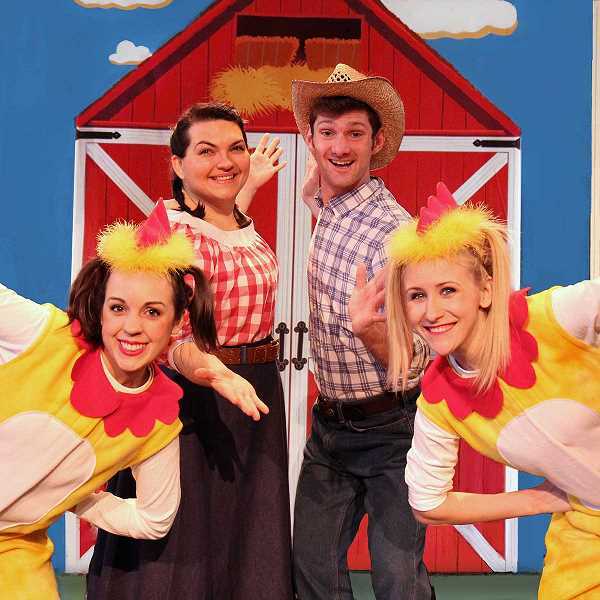 Led by four professional actors, "Chicken Dance" portrays a colorful story of two barnyard chickens on a mission to win the barnyard talent contest first prize of two tickets to see the great Elvis Poultry in concert. Every barnyard has its bully! But two of the barnyard's chickens, Marge and Lola, will not stand idly by. But first, they must present a performance that will score higher than a flock of very talented ducks, led by Mac who loves to play the bully. Can Marge and Lola face their challengers, against all odds, and win the talent contest? This year, the Sherwood Center for the Arts is offering fun, engagement activities before each performance. So, come early to make crafts, learn dances or songs, or other fun interactive adventures. Activities will start at 1 p.m., and the doors to the theater will open at 1:30 pm. Tickets are $5 for all ages and can be purchased online or at the door. Call 503-625-4ART. Since the beginning of ArtsPower in 1985, the organization has created and premiered 30 new musicals and dramas that are now part of the repertoire of quality, American theatre for children and their families. ArtsPower has helped to light up the hearts and minds of more than 13 million children and adults by bringing our musicals and dramas directly to young people in kindergarten through the ninth grades, their families, and their teachers in first-run regional theatres, cultural centers, university auditoriums, and schools throughout 49 states and the District of Columbia. ArtsPower was established firmly around one most important priority: to create outstanding, spirited theatre that speaks intelligently to and resonates powerfully with our audiences, most of whom are young people aged 6 to 15.